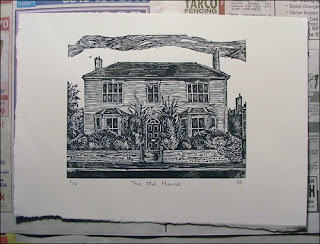 Managed to finish off the house print this week after several trial printings and inking mishaps. The resingrave didn't take kindly to having large areas cleared away, but two evenings with the square scorper sorted it out. Looking forward to moving on to some maple blocks for the next engravings. 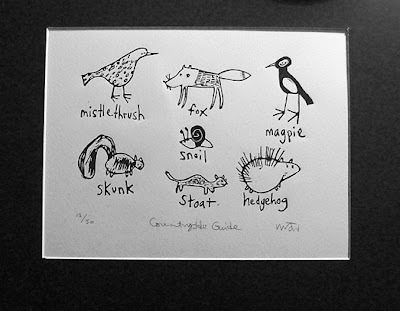 Anyway, here's the final version of the print (now in black rather than green!). Speedball ink on Windsor and Newton 220gsm Smooth paper. 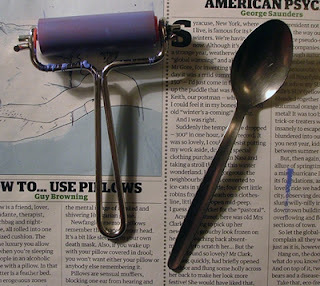 Today, our new tibby tiny roller from the good people at Great Art (with teaspoon for scale). We bought this for doing the fiddly inking which our big (120mm) roller can't quite manage. We were quite sceptical at first, the bent wire frame looks a bit cheap, and it has "Made in W. Germany" stamped on the end, but the red rubber is nice and soft and it inks really well. Its especially good for doing little bits of multi-coloured prints without having to fiddle around masking bits off with tape. We spent a lovely day pottering around in Holt last Friday after a week of working hard. Toyed with the idea of buying a Howard Phipps print ("Winklebury Hill Fort") in the Bircham Gallery but couldn't make our minds up so settled for the exhibition catalogue instead. We also bought a wonderful book of linocuts by Robert Gillmor, whose work we first noticed on the front of the Collins New Naturalist series. Much tea and cake was consumed amongst the sloping floors and ancient beams of Byfords, then a dark and windy trip back to Norwich. We've also been stocking up on materials ready for a raft of new projects. Lots of new inks and several blocks of maple arrived from Lawrence last week, and we got a pack of tiny mixed endgrain woodblocks and our first sheets of Zerkall printing paper from Norwich Art Supplies, which is rapidly becoming our new favourite shop. Its a proper old fashioned art shop, filled with far too many things that we can't afford but still want to buy. Watch this space to see what we do with all our shiny new stuff! The first in a potentially very occassional series! 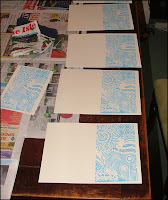 Today, Speedball Block Printing Inks. Oil-based inks are great, rich and dark and tacky and lovely to print with. However, when you're in a tiny house they're suddenly less good. Cleaning up is fairly nightmarish when you try to juggle an inking slab, rollers and pallette knives without covering the kitchen and bathroom in dark oily splodges, and it's quite a challenge to find space to leave prints drying for several days (our high tech solution was a bit of string tied between a curtain pole and a water pipe in the boxroom). 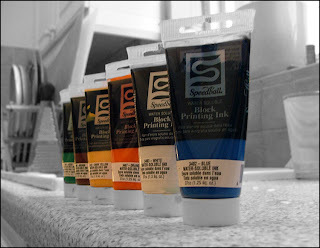 So, we now do nearly all our printing with water washable relief inks, and our current favourites are Speedball. They lack the sumptuous glossy sheen of oil inks, but its a fair trade off given that they are so easy to use. The colours mix well, they print nicely, and, best of all, cleaning up now takes minutes rather than days! Happy New Year! Space year 2007, what a time to be alive...Lots of ideas for prints, but too much other stuff going on at the moment to get much printing done. We're also low on supplies at the moment so are putting together a Lawrence order, and toying with the idea of buying maple blocks from the US. We managed to do a few things last weekend in between watching the football (normally we disdain it but we're suckers for the 'magic of the cup' hem hem) including printing these jazzy cards. It started off as a scrap of lino which we were attacking with our new tools just to see how they cut, but in the end we decided that we may as well print it. Not quite a masterpiece, but good fun all the same. 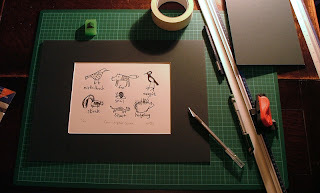 We also finally got round to mounting and framing our Melanie Wickham print which we bought at the Printmaker's Gallery in St Ives back in October. Our framing expertise is slightly lacking, but once it was on the wall and we stood back a bit it looked great! Here's our ever so neat framing/dining room table and assorted tools (including essential Norwich Castle Museum souvenir rubber). And here's a bigger pic of the print. We love it.